Reporting is an ongoing process in both monitoring and evaluation. Monitoring is generally undertaken to provide evidence about the type and amount of work done in the agency and used to inform decisions about staffing, programming and other resource use. However, it also forms the bulk of information used for accountability purposes in reporting to funders and other groups to whom the agency is accountable. In this case, reporting schedules are often established as part of a funding agreement or a contract with another agency. Interim reports may be required on a quarterly basis, with an annual report to be submitted at the end of the funders’ fiscal year. Reporting on programme evaluation may follow a similar process if funding is being received from an external source. In any case, interim reports are generally made orally to the steering committee at or in advance of its meetings in order to obtain feedback about progress to date and work through any revisions that may be required to process and any part of the project. Formal, written reports are generally also provided after each phase of the project: preparation, data collection, data analysis and follow-up, if any. Written project reports generally include: acknowledgements (staff and clients involved in the project, funders, steering committee members); an introduction (study or process background and, if possible, a description of process challenges and successes); the project framework; the data analysis plan and, in later stages, data analysis results; discussion of implications for practice improvement; and recommendations. The Alberta Council of Women’s Shelters in Canada collaborated with eight member organizations in a learning initiative to strengthen shelter practices related to safety, health, cultural competence and legal issues. Inspired by the experiences shared by shelter workers across regions during the 2008 1st World Conference of Women’s Shelters, the Practical Frameworks for Change identified and implemented promising shelter practices, which included the training of shelter staff and a collective evaluation of the process. Implemented from September 2008 through August 2010, the project had a positive impact on shelter staff knowledge and competence related to data collection and its relevance to service quality; improved the quality of service delivery; and helped enhance the safety and well-being of women in Alberta shelters. Using an Outcome Measurement Framework, project results focused on women’s satisfaction with their relationship with staff; their safety and their knowledge of various community resources corresponding with the promising practice areas identified (i.e. safety, legal, health and culture). The initiative generated recommendations for further action, enabled participating shelters to integrate new practices into their operations, and promoted upscaling of practices across Alberta Council members. Sources: Jan Reimer. Alberta Council of Women’s Shelters. 2011; Alberta Council of Women’s Shelters. 2011. 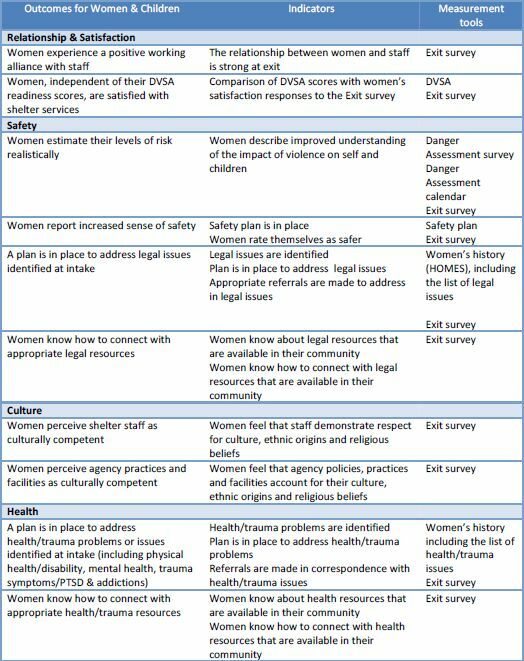 Practical Frameworks for Change Evaluation Report.ACWS. Alberta.